This article was published in Audiowings, the journal of the Australian Wildlife Sound Recording Group, Volume 13, No. 2, December 2010. You can also download the article in pdf format here (684 kb). You can hear the sound clips that go with the sonagrams, further down the page. On summer nights in woodland areas, above the din of crickets comes the occasional call of the Owlet-nightjar. The call may last but a few seconds and occur just once every hour or so, making it very difficult to record. Last summer I took to keeping my Olympus LS-10 pocket-sized recorder by my pillow at night, connected via a long lead to a stereo microphone placed on my verandah or under a tree outside. I would lie in bed and use headphones to listen in for long periods, leaving the recorder running, and if there were no calls I would simply delete that track and begin a new one. I used no playback and my observations were of the natural calls of the species. I have on occasions been lucky enough to observe an Owlet-nightjar in daylight, usually peeping out of a hollow tree in the dry woodland habitat of my property in Capertee Valley in NSW. My place is ‘prime Owlet-nightjar habitat’ with lots of tree hollows, and with calls from as many as five or six different birds at any one time, audible from my front verandah. Debus (1997) and Brigham (1999) found that Australian Owlet-nightjars called more and were more active on moonless rather than moonlit nights. This may be a defence mechanism to protect themselves from predation by larger owls which are most active on bright moonlit nights. Not knowing this, I had expected my Owlet-nightjars to be calling well on the brightest nights, but most of my recordings, especially the call and answer routines, were made when there was no moon visible. They called well after a thunderstorm, and 2.30 – 5.30 a.m. DST was also a good time for recording, i.e. up until the first hint of pre-dawn light. Sometimes I recorded good sequences 9 p.m. to midnight. On several occasions I have recorded Owlet-nightjars calling briefly during the day from a tree hollow. All of my recordings for this study were made from November 2009 to April 2010. When you record birds but do not see them, there comes the problem of identification. After many months of recording and listening I sent what I thought was a representative collection of eight different Owlet-nightjar calls to a number of experts. [You can hear this medley of calls on the Audiowings CD]. Steve Debus in particular was very helpful and is a noted nightbird authority. Bird guide Carol Probets made helpful comments. Thanks also to Audiowings members Dave Stewart, Fred van Gessel, Bill Flentje and Tony Baylis for your comments, and to Lisa Doucette (from Canada) who is currently studying the species in the Armidale, NSW region. I should add that there was not unanimous agreement on the identification of all the calls, but the majority felt that the calls I have presented here are from the Owlet-nightjar. The fact that not everyone was in agreement may indicate that there is some regional variability in the calls of the Owlet-nightjar, and that some calls may be used more prominently in some regions, and not in others. If any readers disagree with my identification of these calls, feel free to say so. 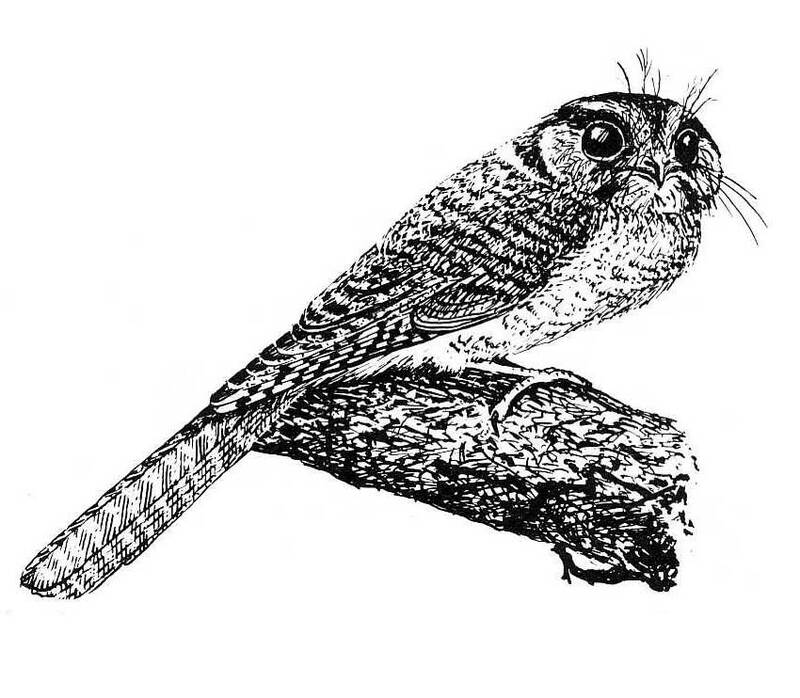 HANZAB describes the voice of the Owlet-nightjar as ‘not well known’, providing sonograms for three different types of calls and mentioning Churr, Cry, Yuk, Trill, Che-ok, Hiss, Screech, Rattle and Trill. I could not exactly match my Owlet-nightjar calls with the sonograms in HANZAB. However HANZAB says that often Owlet-nightjars will answer one another, and for my own study I was intrigued by the calls and answers that I could hear, which helped me to verify in my own mind that the calls I have presented here are all from the Owlet-nightjar. One or two of the people who made comments said that the jik call (Figure 1, number 6) sounded to them like a Sugar Glider. So far as I know there are no Sugar Gliders on my property, and certainly in many long nights of recording I have never heard any of the typical ‘shrill yapping’ Sugar Glider calls. I am convinced the jik call is from an Owlet-nightjar, and Steve Debus has verified this. The hiss call I have presented here (Figure 1, number 5) was considered by one or two people to be a Barn Owl. While I do occasionally have Barn Owls visit my property, I feel sure that much of the hissing that goes on here is from Owlet-nightjars. I recorded several sequences that begin with hissing then evolve into more typical Owlet-nightjar calls (an example can be heard on the CD), which convinced me that Owlet-nightjars do sometimes give hissing type of calls. Carol Probets pointed out that the Owlet-nightjar hiss seems to swell more slowly than does the Barn Owl hiss, and the latter is also more shrill. Lisa Doucette had never heard Owlet-nightjars hiss during her fieldwork in the Armidale region, where she uses playback for monitoring populations. Given my experience that Owlet-nightjars DO hiss, care should be taken when doing surveys at night as it is all too easy to tick off ‘Barn Owl’ when in fact it might be an Owlet-nightjar! A typical sequence of calls often came in a burst of 3-6 syllables. An answering bird might also give 3-6 syllables but in a slightly different timbre, for example the falsetto churr (Figure 1, number 3). Also, the hiss call often occurred as 4-6 syllables. Some calls had a broadband hissy type of quality, while other calls were clearer, and you can see this in the sonograms where a smudgy look equals a hissy quality. The jik call sometimes occurred as a longer series lasting several minutes. Everyone agreed that cut no. 7 in Figure 1 was definitely Owlet-nightjar, and that this is their best known call. The sound is somewhat reminiscent of a Brown Falcon. This call is the only one I am not 100% sure of. It seemed to be used as part of the Owlet-nightjar call-and-answer sequences. I feel certain this must be Owlet-nightjar but I cannot prove it. It has been quite a challenge to make this study of Owlet-nightjars – with too many sleepless nights waiting for them to call! But now I am hooked on this intriguing, cryptic little owl, so no doubt there will be more sleepless nights for me this summer. Brigham, R. Mark; Gutsell, Robin C.A. ; Geiser, Fritz & Wiacek, Richard S., 1999: Foraging Behaviour in Relation to the Lunar Cycle by Australian Owlet-nightjars Aegotheles cristatus; Emu 99(4) 253 – 261. 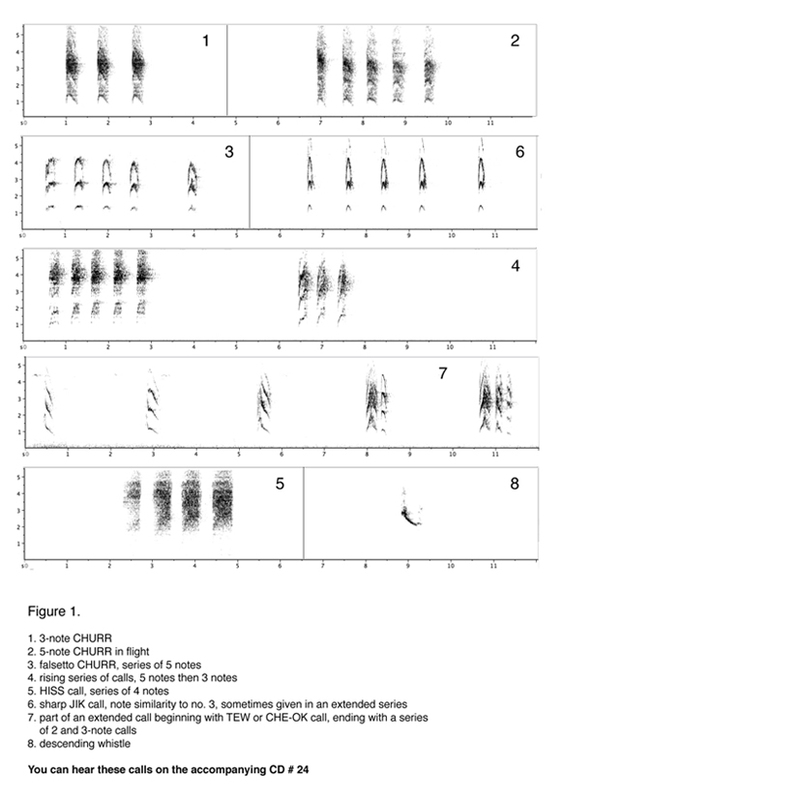 Debus, S.J.S., 1997: Vocal behaviour of the Southern Boobook Ninox novaeseelandiae and other nocturnal birds; Australian Raptor Studies 2: Birds Australia Monograph 3, pages 71-85. Higgins, P.J. (editor), 1999: Handbook of Australian, New Zealand & Antarctic Birds, volume 4, pages 1036 – 1048. Sketch is from The Atlas of Australian Birds, RAOU, 1984. Here are the sounds to go with the sonagrams. The calls are introduced, and are in the order 1-8 according to the numbers on the sonogram. Page created 2011 and upgraded 5 June 2017.